MAXQDA also allows you to attach memos to codes. These memos often contain category definitions and anchor examples, which can clarify the meaning of categories of original quotes. Right-click on a code and select Memo from the context menu. 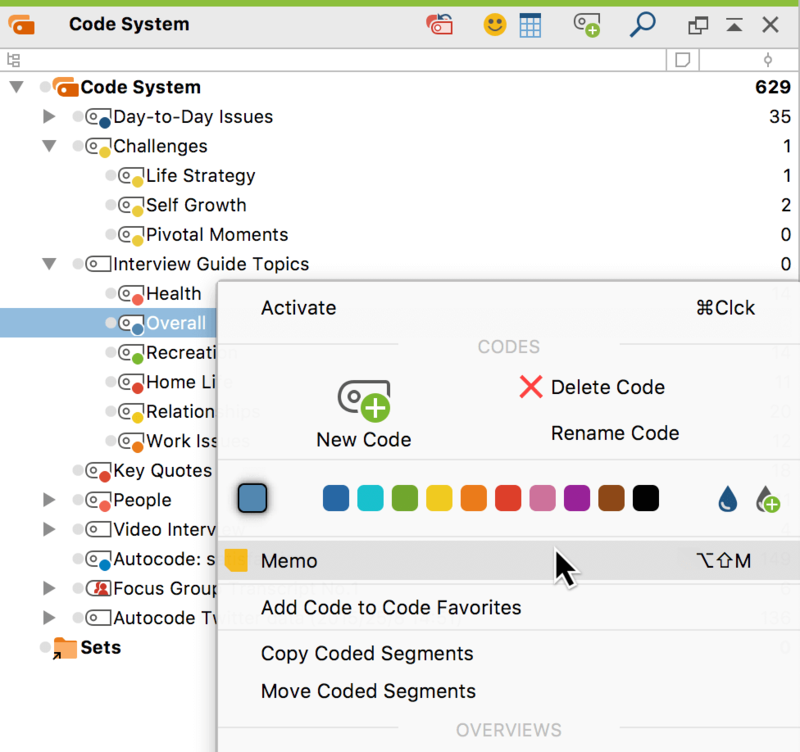 Alternatively, you can create a memo for the currently selected code using the keyboard shortcut Alt+Shift+M (Windows) or option+shift+M (Mac). The fastest way to create a new memo is to double-click in the memo column to the left of the code frequencies. After closing the memo, you will see a yellow memo symbol next to the code in the “Code System”, making it easy to recognize that this code has a memo attached to it. Tip: For code memos, you will often want to insert an anchor example or explanation of when the code should be used. To insert parts of an open text in a memo, simply highlight the desired text, then drag and drop it into the memo with the left mouse button. As with other memo types, you can choose another one of the visualization options in the place of the default yellow memo icon. The selected icon will appear next to the code in the “Code System”.